Coffee is a serious business these days and it takes a serious bit of kit to produce a seriously good cup of joe. Our Smeg coffee machines are just that. Precision engineered and beautifully finished to a standard that will enhance the most stylish of kitchens. As you’d expect from Smeg, the aesthetics are coolly timeless. 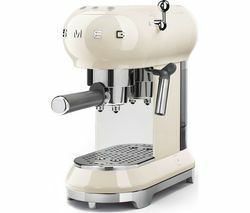 Take the ECF01 Coffee Machine, available in black or cream, a sleekly curvaceous retro design that echoes classic espresso machine looks with the sort of contemporary panache Smeg has become known for. Beyond its kitchen counter-enhancing looks, this Smeg coffee machine is just as impressive. Designed to deliver great coffee quickly and efficiently, its Thermoblock system heats up the water quickly from switch on, so you're not left waiting for your coffee fix. And because the little details are all important, a heated surface at the top of the machine is ideal for warming your cup, ready for you to enjoy your favourite coffee at its optimum temperature. The ECF01 is compatible with both ground coffee and paper pods and comes equipped with a 15-bar pressure and milk frothing wand, so you can experience café style beverages at home. At the top end of our collection of Smeg coffee machines, the CMS6451X is undoubtedly a machine that’s fit for coffee perfectionists. 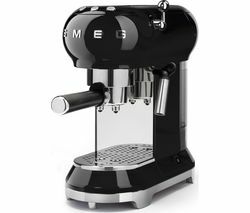 Featuring bean-to-cup functionality that allows you to make coffee from scratch for an especially rich, aromatic brew. This advanced machine gives you the flexibility to explore and experiment in pursuit the perfect cup of coffee. Not only does this machine accept both beans and ground coffee, it also has five selectable coffee strengths - perfect for sampling an array of coffee flavours and strengths. Looking for a coffee machine that suits your budget and needs? View Nespresso machines in an array of shapes and sizes if you’re looking for a Nespresso pod compatible machine and view our wide range of coffee machines to browse an array of coffee brewing solutions, including bean-to-cup models.